On the Keyboard tab in the Preferences screen, you can change the shortcut key combination for each item in EditPad's main menu. To assign a new shortcut key combination to a menu item, select the menu item from the list. Then click on the box labeled "shortcut key". Press the key combination you want on the keyboard. To remove a key combination from an item, click on the "shortcut key" box and press the delete or backspace key on the keyboard. Each shortcut key combination can be used by only one menu item. If the shortcut key combination you assigned to the currently selected menu item is already used for one or more other menu items, those other menu items will be listed in the box labeled "conflicts with". You can also assign shortcuts keys to tools and to macros when configuring tools and recording macros. You cannot assign the same shortcut key to both a menu item and a tool or macro. If you run out of key combinations, EditPad also supports two-key keyboard shortcuts. When you press the first key combination of a two-key shortcut, EditPad will do nothing except remember that you pressed that key. The next key you press is then taken as the second key. If it forms a valid two-key shortcut, the corresponding action is executed. If not, neither key press will have any effect. To configure a two-key shortcut, click on the "two-key shortcut" radio button. Then click on the "shortcut key" box and press the first key combination. The first key must either be a Ctrl+Letter combination (possibly including Shift and/or Alt), or a function key (possibly including Ctrl, Shift and/or Alt). Up to 15 different key combinations can be used as the first key in a two-key pair. Then click on the "2nd key" box and press the second key combination in the two-key shortcut. The second key combination can be any key, including a letter without a modifier (Ctrl, Shift or Alt). If you specify a letter without a modifier, both the letter without the modifier and the letter with the same modifiers as the first key will work. E.g. if you assign Ctrl+K, B to the Begin Selection command, you can begin a selection by pressing Ctrl+K followed by B, or Ctrl+K followed by Ctrl+B to begin a selection. Specifying a letter without modifiers as the second key makes it easier to quickly press both keys, since it doesn't matter if you release the Ctrl key before the second key (the letter B in the example) or after it. When using two-key keyboard shortcuts, it is a good idea to add the keyboard status indicator to the status bar. When you press the first key in a two-key combination, the keyboard indicator will show that key. That way you know the next key you press will be interpreted as the second key in the combination. After you press the second key, the indicator reverts to showing num lock, caps lock and scroll lock. 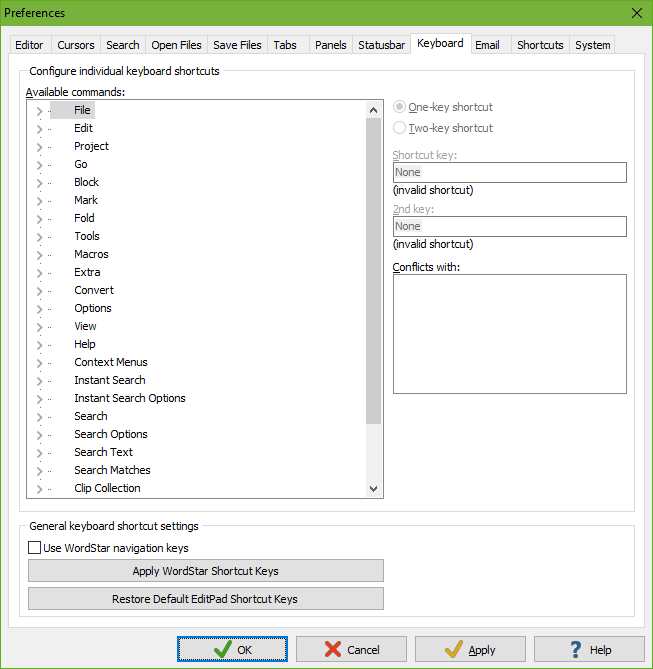 EditPad supports the classic Wordstar navigation keys for people who are used to them. WordStar is an old word processor that used Ctrl+Letter key combinations to navigate through the document. WordStar was created at a time when most keyboards did not yet have separate arrow key blocks. The checkbox only enables the navigation keys. It does not change any of the key combinations that you assigned to EditPad's menu items. Note that many of these navigation keys conflict with standard Windows shortcut keys. E.g. Ctrl+S is the standard Windows shortcut for File|Save. In WordStar, Ctrl+S moves the text cursor one position to the left, just like the left arrow key. Click the "Apply WordStar Shortcut Keys" button to assign WordStar key combinations to various menu items. E.g. Ctrl+K, S will be assigned to File|Save. Shortcut keys assigned to EditPad menu items that don't have a WordStar equivalent will not be changed. The assignment is a one-time event. You can freely reconfigure any of the changed keys. Click the "Restore All Default Shortcut Keys" button to restore the default EditPad shortcuts for all menu items. It will also turn off the option to use WordStar navigation keys, since many of those conflict with EditPad's default shortcuts. The keyboard navigation keys cannot be configured. They are always available, even when you've enabled WordStar navigation keys.